Over the last decade, the acronym UL has been creeping into the field of cosmology. It has the impressive meaning of "ultra-luminous" or "beyond bright". In at least two categories, this superlative is a distortion caused by the theoretical interpretation of observations rather than a direct description of observations. Take the case of ULIRGs -- Ultra Luminous Infra Red Galaxies. Arp 220, pictured above, is the brightest of the ULIRGs. (Astronomer Halton Arp compiled the Catalogue of Peculiar Galaxies, in which this object is number 220.) The standard interpretation calculates its distance by the amount its spectral lines are shifted toward longer wavelengths (redshift). To be this bright at that distance, it must be generating light far more copiously than any other astronomical body. Hence, it is "ultra-luminous. "Proponents of the standard interpretation speculate that the excess energy is produced by a collision of two galaxies behind an obscuring cloud of gas and dust. But if redshift were caused by some mechanism intrinsic to the body, Arp220 could be close enough to be of normal luminosity. If it were even closer, it might be "Under-Luminous." Do we have any evidence that Arp 220 is closer than its redshiftdistance -- other than the fact that it appears too bright for conventional astronomical theories of how galaxies should work? The evidence is there, but it takes a couple of steps to understand. For the past few years, astronomer Margaret Burbidge has been using her telescope time to study discordant redshift associations. In 2001,she, Halton Arp and the Chinese astronomer, Y. Chu, published a paper about the objects in the vicinity of Arp 220. They discovered two pairs of quasars flanking the nucleus north and south of Arp 220. In addition another double pair of quasars forms an s-shaped line to the east and west of Arp 220. And there is a previously discovered "background cluster" of four tiny galaxies that just happen to fall in a straight line pointing directly at the nucleus of Arp 220. The conventional explanation for these discordant-redshift associations is that the quasars and galaxies are grouped together by coincidence. The extreme improbability of that being the case is overlooked. The second step is to notice that the discordant-redshift objects tend to occur in pairs that have about the same redshift and that are located symmetrically on opposite sides of the primary object's nucleus. Furthermore, the redshifts of these pairs tend to decrease in well-demarked steps with distance from the primary object. To believe "background objects" could be so arranged by chance is to abandon discernment. Arp interprets these associations as family groups. All are located in the vicinity of the primary body. The higher-redshift bodies have been ejected from the lower-redshift bodies. As the ejected bodies age and grow into normal galaxies, their luminosities increase and their redshifts decrease. Rather than being a coincidental clump, they are an evolving population of genetically linked objects. If the observed stepwise redshift is intrinsic to associations of galaxies and quasars, there is no reason to prefer a redshift-determined distance to a luminosity-determined distance. 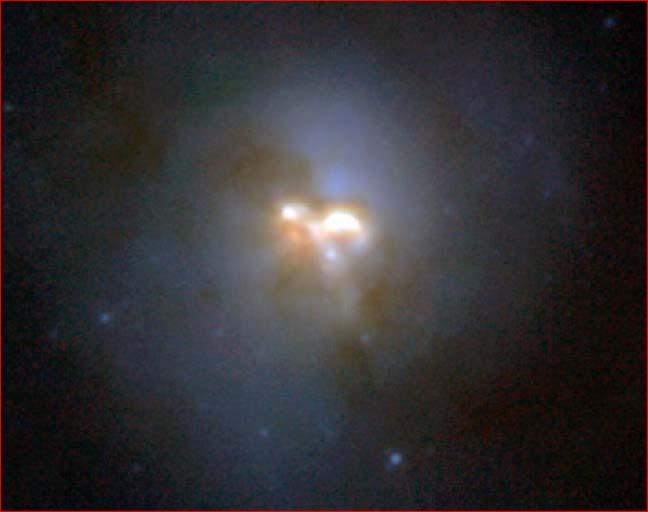 The observed luminosity of Arp 220 would place it much closer, not only in distance from us but also in correspondence with known processes of energy production. Similar considerations with regard to other ULIRGs would negate UL astronomy and the big bang cosmology, which depends on redshift being an indicator of distance, that gave rise to it.